LED screen manufacturer PixelFLEX will release the FLEXUltra, a 2mm curveable LED display, at the LDI Convention 2014 in Las Vegas, November 17-23. Capable of creating convex or concave curves up to +/- 10 degrees per tile, the FLEXUltra is designed to combine design flexibility with ease of installation to make FLEXUltra a dynamic LED display product. The FLEXUltra concept incorporates machined aluminum frames that are customized to the installation allowing the client control over their design. Additionally, FLEXUltra is front-accessible and the panels can be quickly removed by utilizing two magnetic grip handles to remove the panel from the frame without dissasembling the entire wall. 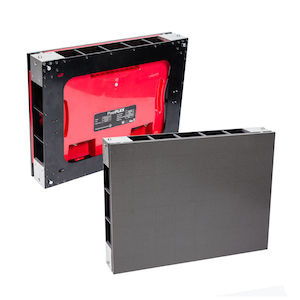 With a cabinet made of special high tolerance, machined aluminum and the newest full black-face LED technology, the FLEXUltra can be utilized in many different types of install applications. With a brightness of 1200 Nit and a combined frame and tile weight of 25 lbs, the FLEXUltra keeps in line with the high quality and lightweight characteristics PixelFLEX LED products have become known for. In addition, a high refresh rate provides a static and flicker-free display, making it extremely friendly for both photo and video applications. Ethercon data and Neutrik True One power connectors give the FLEXUltra dependable connections, and the magnetic guide ports allow for secure fixing of panels to frames.